The NYSE report that Zero Hedge discussed shows Goldman Sachs trading over 1 billion shares in the principal program trading category. What the table doesn’t show, but a deeper look at the numbers reveals is that the vast majority of this total is trades by our quantitative trading desk. This desk is participating in a relatively new NYSE program called Supplemental Liquidity Providers. The NYSE started the program to attract liquidity to the exchange. As an SLP, this the desk makes markets in NYSE stocks. They often do high-frequency trading (which is simply auto-quote market making) where they send out hundreds of “baskets” of stocks at one time. Program trading, as defined by the NYSE report is any strategy that sends out a “basket” of 15+stocks at one time. I am happy to discuss this with you if that description doesn’t make sense. In order to dig deeper into Canaday's statement, Zero Hedge performed a historical analysis of NYSE Program Trading (PT) data (which is public) and came up with some curious observations. But before I get into the results, it makes sense to evaluate the facts behind Goldman's retort and in order to do that, let's first observe just what this Supplemental Liquidity Provider program is. Are on parity with quotes from floor brokers and those on the Display Book, encouraging DMM participation and higher market quality. Have parity with DMMs and the NYSE Display Book, no matter whether the Broker’s order is represented physically or via an algorithm or e-Quote. That is, they can join the first displayed quote on the Book, and split stock with that order. Have the ability to route all or part of a customer order to an external algo engine from their handheld order-management device. These algorithms offer Floor Brokers the ability to provide customers with additional execution capabilities in an environment that offers a balanced combination of technology for fast, automated and anonymous order execution; and a physical marketplace for discovering block-sized liquidity and improving prices. Can utilize a technology feature called Block Talk to more efficiently locate deep liquidity. Block Talk is designed allow Floor Brokers to broadcast and subscribe to specific stocks they have an interest in, creating an opportunity to trade block-sized liquidity that is not accessible electronically. Since the messages contain no specific order information, customers benefit from a discovery process in a secure environment free of impact, information leakage or intermediation. Also have the ability to identify via their hand-held order-management system the last five buyers and sellers in a stock by badge number. They can message a specific member that they are in touch with the contra side. This is valuable information for pricing blocks, as it is about real buyers and sellers, not indications of interest. Have a special feature with their reserve orders: when the displayed amount is exhausted, reserve interest replenishes on parity. In contrast, the “upstairs” reserve order functions as it does in an electronic market: replenishing at the back of the queue. Are positioned to act on the expanded imbalance and indication information at the open and close of the market. They can participate as agent, or convey insight into the open or close for customers’ decision making. Supplemental Liquidity Providers (SLPs) are upstairs, electronic, high-volume members incented to add liquidity on the NYSE. The pilot SLP program rewards aggressive liquidity suppliers, who complement and add competition to existing quote providers. SLPs are obligated to maintain a bid or offer at the National Best Bid or Offer (NBBO) in each assigned security at least 5 percent of the trading day. The NYSE pays a financial rebate to the SLP when the SLP posts liquidity in an assigned security that executes against incoming orders. This generates more quoting activity, leading to tighter spreads and greater liquidity at each price level. An NYSE staff committee assigns each SLP a cross section of NYSE-listed securities. Multiple SLPs may be assigned to each issue. A member organization cannot act as a Designated Market Maker and SLP in the same security. SLPs have the same publicly available trading information and market data that all other NYSE customers have available to them. "We’re rolling [the SLP pilot program] out in the 500 most active names where we believe incenting SLPs by compensating them to provide liquidity will supplement all of the other initiatives that we’ve put in place to build the NYSE book." "SLP quoting will provide more liquidity and should make the NYSE more competitive. We have begun to see significant shifts in terms of the frequency with which the NYSE is at the NBBO, and we expect increases in volume and market share to follow." With a mere 500 securities to work with, especially being excluded from being a DMM in SLP names, maybe Canaday can explain the economics to GS' program trading desk from participating in the SLP? Another relevant question is just who are the current SLPs? It seems the answer is difficult to pin point. It is known for a fact that Goldman Sachs and Spear, Leeds and Kellogg (owned by GS) are currently definitive SLPs, with Knight Trading and Barclays also presumably becoming SLPs as well, but there has been no confirmation either way, potentially implying that Goldman could have a monopoly in liquidity provisioning. If the program is truly as attractive as GS' spokesman makes it seem, why are other major equity players not clamoring to participate in it? After all, the benefits to SLPs are "obvious." Following up on that, has there been an extension of the SLP program recently? Zero Hedge has not heard of one. The SLP, which was approved in late October (see above) was supposed to terminate on April 30, this last Thursday: "The proposed pilot program will commence on the date upon which the SEC will approve the New Market Model and will continue for six months thereafter ending on April 30, 2009." If the SLP is now over, should one expect GS's principal volume trading to drop dramatically, if, as Canaday says, the volume is mostly SLP driven? Also, does that mean volatility in the market is about to spike as there are no entities (well, one entity) providing NBB and NBOs? Indeed, many questions arise when one digs into the nebulous world of NYSE liquidity providers, many more than there are clear cut answers to. Perhaps it is time for Mr. Canaday to address as many of these questions as possible head on. Zero Hedge would be happy to provide him with a forum for clarification. In the meantime, here are the facts, courtesy of the NYSE's public record keeping system. The first chart below demonstrates total program trading in the NYSE since mid August, a month before the Lehman bankruptcy. The black line demonstrates total indicated program trading, which absent volatility, has remained relatively stable, averaging roughly 4 billion shares weekly. And while most other NYSE member firms have seen their PT volumes stay relatively flat as well, GS has seen a dramatic ramp up, controlling about 15% of PT in Q3 of 2008 which has risen to almost a quarter of all NYSE PT over the past quarter. 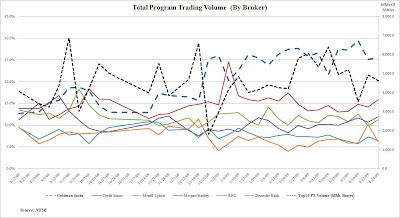 But while total Program Trading includes Principal trading (i.e., trading not on behalf of its clients but for its own benefit; this is the category where SLP would also fall in under NYSE guidelines), as well as Facilitation and Agency trades, the big surprise arises when one looks at a historical analysis of merely Principal trading. 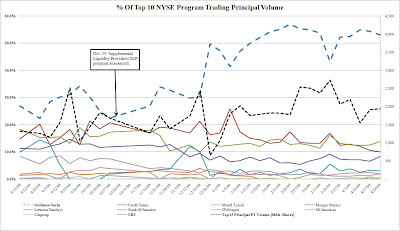 The chart below pulls only the Principal trading data for the top 10 NYSE members. And like before, while the total amount of total Principal trading as a portion of NYSE PT has stayed relatively flat, at about half of total PT volumes, Goldman's share has exploded over the past six months: while GS was responsible for around 27% of Principal NYSE stock trading in Q3 and most of Q4, that number has risen to the low 50% range over the past 3 months. The last two charts demonstrate the divergence of Principal trading as a fraction of total PT by any given broker. 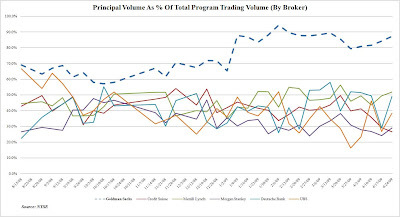 It is obvious that while the majority of top NYSE member firms have had Principal trades stay around 40% of their total PT volume, Goldman has seen its share of Principal trading go from 60% all the way into 90%: a vast majority of all its trades are merely for its own benefit (and potentially as an SLP funnel). And lastly, demonstrating Non-Principal trading indicates, as expected, a trend where GS' client have taken a progressively smaller relative role as part of its total PT, and currently GS Agency volume as a % of Total PT is the lowest of all top NYSE brokers, with total NYSE Agency volume remaining relatively stable. So what is really going on here? Connecting the dots is difficult with so little freely available information, and the NYSE seems to be keeping mum on disclosing anything above the absolute minimum when it comes to the SLP, and brokers' participation in it. My interest was piqued by one of the points Canaday brought up: "What the table doesn’t show, but a deeper look at the numbers reveals is that the vast majority of this total is trades by our quantitative trading desk." Maybe Canaday can expand on this a little more, as it is public knowledge that recently the heads of GSAM and Goldman Global Alpha left the company: Ray Iwanowski and Mark Carhart, who ran the quant operation, and Giorgio De Santis who ran research, are no longer at the company. Their departures in themselves are not surprising considering Global Alpha lost over 80% of assets or roughly $10 billion in the course of 2008 (precipitated by the quant shakeout of August 2007). But is there something else going on here? Their departures occurred at the end of March, just as Goldman's Principal % of total NYSE trades had peaked at almost 55%, yet when they departed, this number dropped by a not insignificant 12% to 43%, only to rebound promptly thereafter. Is there more here than meets the eye? As regular readers of Zero Hedge know, the topic of market liquidity has been a major one over the past 3 weeks, and I have demonstrated that traditional market neutral, high-frequency quants, aka independent liquidity providers have not only suffered significant P&L losses in April, but have deleveraged to a point where their presence in the market is negligible, resulting in dramatic volatility spikes on low volume. Could it be that Goldman is singlehandedly benefitting from being the liquidity provider of last resort, even more so as there are virtually no other participants in the SLP program? And, as is expected, with a liquidity "monopoly", come unprecedented opportunities to take advantage of this, depending on one's view of the market. Of course, Zero Hedge is not suggesting Goldman has done this, but in a world where so little transparency exists into the core workings of the equity market, which most market traders have been clamoring has a "very fishy feel" about it, with Hard To Borrow notices appearing for such major index hedging securities as the SPY and IWR, it is no wonder that explanations are being sought. In order to provide some much needed visibility, Zero Hedge, as noted above, is hoping Mr. Canaday will approach Zero Hedge and give a more elaborate explanation of what is really happing, and why GS is dominating NYSE program trading, which lately has become a major percentage of total NYSE volume. It is easy to see why market participants could be concerned about this particular breed of opacity. In the meantime, I will continue presenting NYSE program data, as it is everybody's right to be caught up with all the facts.